Contact Us Today!Bronze and marble memorial plaques are the perfect way to honor loved ones and remember the legacy they left. Make their words last for generations by choosing a Doty & Sons custom engraved plaque. Our memorial plaques are made from high-quality concrete material and are built to withstand any kind of weather. Our process is easy; simply send us the wording you wish to have engraved, and we will provide a proof for you to review before we begin your custom project. Our memorial plaques are available in a variety of finishes, including marble, cast bronze, and engraved bronze. Interested in learning more about our commemorative concrete benches? Contact us today for more information. Bronze and marble plaques provide a great means to say what is appropriate about loved ones & remembering those who are important in our lives. 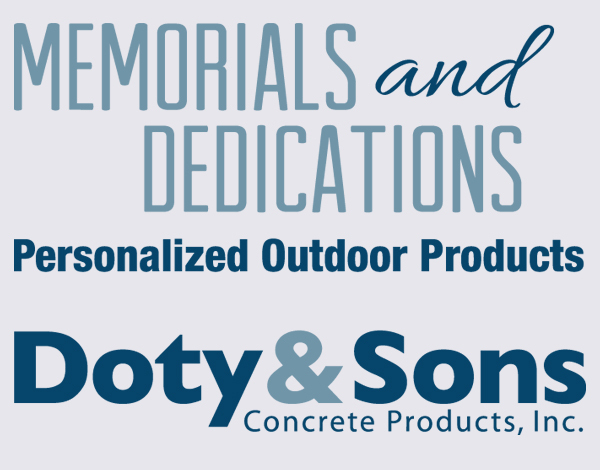 These words will last for many generations because of the durability of the bronze or marble plaques and memorial products manufactured by Doty & Sons Concrete Products, Inc. The process is simple. You give us the wording and we will provide a layout/proof for your review. This layout/proof can either be emailed, faxed, or mailed to you, whichever is most convenient. Standard lead time for plaques is 6 – 8 weeks minimum after receipt of signed order. Expedited lead times are available for an additional up-charge. Please keep these lead times in mind if you are planning a dedication date. If you are planning on a dedication, please include that date with your quotation request and/or with your signed order. Cast bronze plaques are available in many sizes. Size depends on the number of words and the letter size. Pricing depends on the size of the plaque and the number of lines. Letter sizes range from ¼” to ¾” high. Letters on cast bronze plaques are in caps. Font style is Times New Roman. Engraved bronze plaques are beautiful plaques that offer the opportunity for more detail. These plaques are great if you desire a company logo, picture or images where detail is essential. Size depends on the number of words and letter size. Pricing depends on the size, number of characters, images and color. Character size can vary. Font styles available are Dutch Roman, Optima, and Helvetica. 12″ x 12″ plaque shown above. Plaques available in many sizes. Marble plaques give a different look than bronze. Laser engraved plaques are great if you desire a photograph on the plaque. Characters and images are laser etched into the surface for a beautiful appearance. Standard size is 7” L x 5” H. Other sizes available: 6” x 6”, 8” x 8” and 5” x 7” Oval. Pricing depends on the plaque size, number of characters and whether or not there is an image.